It's undoubtedly the most popular event in the USA and something to celebrate every day; freedom! The 4th of July is the date when America was born, the day that independence from the Kingdom of Great Britain was declared. 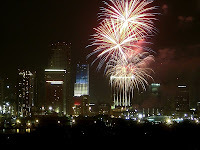 Independence Day is commonly associated with fireworks, parades, barbecues, carnivals, fairs, picnics, concerts, baseball games, family reunions, and political speeches and ceremonies, in addition to various other public and private events celebrating the history, government, and traditions of the United States. American Expats also widely celebrate this day around the world, so remember to say something on the 4th of July.